Kids’ parties always need to have a few planned games or activities, and often, keeping it super-simple is best. For example, for me, the birthday party game I remember most from when I was little involved following a long string of yarn through the house to find a prize. So basically, my mom created a lifelong memory with a ball of yarn and approximately two minutes of prep time. See? Nothing wrong with simplicity. ; ) Like with these balloon party games – each one is quick, easy, but would keep the kids super-happy (just look at that smile in photo #3!). 5. 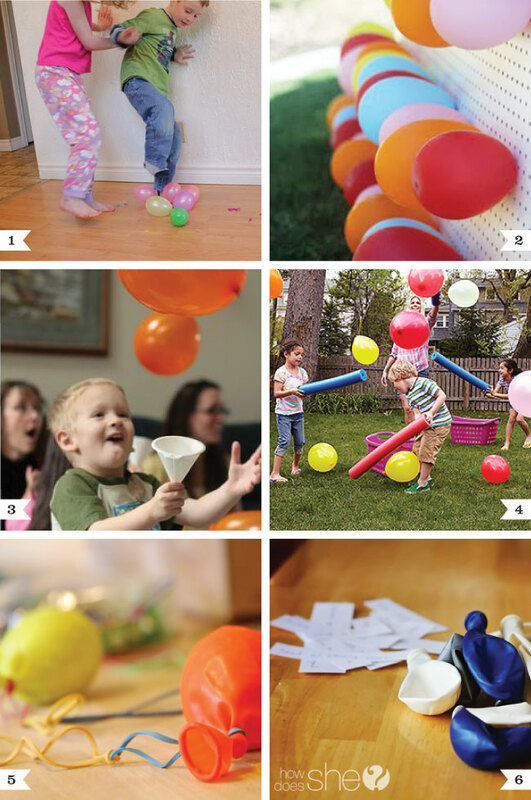 Balloon yo-yos via TinkerLab – This one’s a craft, a fun little party-time diversion, and a favor all in one! Check out how to make a balloon yo-yo here. – Put a dollar bill inside some of the balloons for an extra special surprise! So many great ideas! I think #1 and #3 have to be saved for T's birthday and Halloween parties this year! Your blog is adorable, and I love the balloon party idea. Thanks for sharing our balloon yo-yo activity!